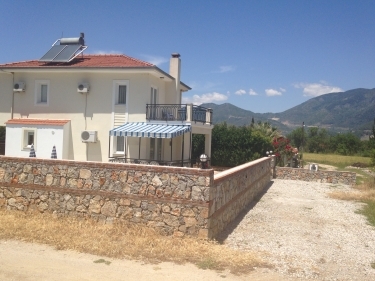 Villa in Uzumlu Nr Fethiye - 3 Bedrooms - Sleeps 6. 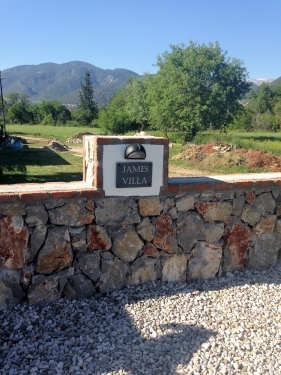 James Villa - Modern - Very Clean. WIFI AVAILABLE - FREE & UNLIMITED. 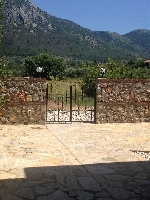 James Villa is a detatched, spacious, newly built 3 bedroom villa situated in the village of Uzumlu.It is in a very quiet & picturesque area with stunning mountain views.It has it's own private pool with depths of 1m-2m with steps at the shallow end & measures 8m x 4m.The garden area is completely paved & enclosed.There are 6 sunbeds provided.Also patio tables & parasols.A rotary washing line is also provided.There is a barbecue for outdoor cooking.Large balcony with sun canopy provides plenty of shade. 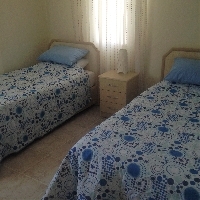 Fully furnished to a high standard James Villa has 3 spacious bedrooms on the 1st floor. The Master bedroom has king size bed and double patio doors opening onto a large balcony with stunning mountain views. 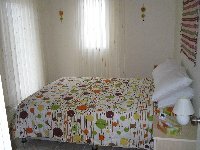 The 2nd bedroom also has king size bed & small balcony again with mountain views.The 3rd bedroom has twin single beds. The 1st floor bathroom is fully tiled & has jacuzzi bath & shower over. There is a marble staircase leading down to the ground floor living area which is open-plan. There is also a ground floor bathroom which is fully tiled & has a walk-in shower. 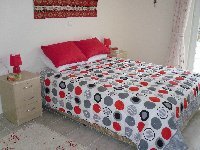 The kitchen area is fully fitted & well equipped,with:Microwave,full sized oven & hob,fridge/freezer,toaster,washing machine & ironing board.There is a dining area with table & chairs for 6. The lounge area has 2 sofas,beanbag,50"LED TV,dvd player,cd player with ipod dock,satellite receiver and feature fireplace.Also provided are numerous dvd's,cd's and books. 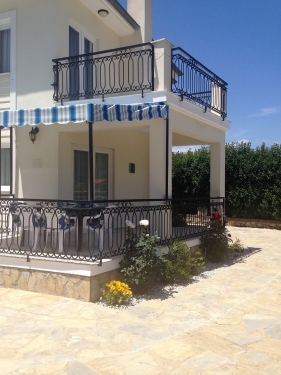 Double patio doors open out onto a large balcony which has additional dining for 6. 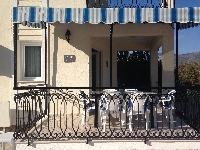 James Villa is fully air-conditioned and is equipped and cleaned to a higher than usual standard to make for a more comfortable & enjoyable holiday.All towels & bed linen are provided.Hairdryers are also provided.Also beach towels are provided for 6 people.We have a new travel cot & mattress, complete with sheets/blankets for a baby/toddler, should you need one. WIFI is available in the villa. It is free & unlimited & as fast as Uk internet. In Uzumlu village there are shops,bars,restaurants,Post Office,bakery,internet cafe and small Friday market.The village centre is approx 5-10 min walk.Car hire is recommended but not essential as local Dolmus is cheap & runs frequently.Fethiye is approx 20mins drive, Hisaronu & Olu Deniz approx 25 mins. The nearest airport is Dalaman which is approx 45 mins. We can arrange a transfer or car hire if required. Unlike most holiday rentals we do not do a same day changeover which means that provide your flight leaves on the day of your booking you will be able to arrive at any time and the same on your day of departure you will be able to stay in the villa if you have a late flight.We have found that previous guests appreciate this and it allows more time for the cleaning to be done to the high standards we expect.We now also provide beach towels for use round the pool,to take to the beach, boat trips etc which saves our guests having to pack & wash their own! PLEASE NOTE THIS IS A NON SMOKING VILLA. NO ALL MALE/FEMALE PARTIES WITHOUT PRIOR CONSENT. BOOKINGS NOW TAKEN FOR 2017 - AT THIS YEAR'S PRICE! Rental Rate fro April,May & October = £395 per week. Rental Rate for June & September = £450 per week. BOOK EARLY TO SECURE YOUR DATES! BOOKINGS NOW TAKEN FOR 2017. PAY £100 PER WEEK DEPOSIT TO SECURE YOUR BOOKING! DEPOSIT REQUIRED AT THE TIME OF BOOKING. DATES CAN BE RESERVED FOR 24HRS ONLY - AFTER WHICH THE DEPOSIT MUST BE PAID OR RISK THE DATES BEING OFFERED TO ANYONE ELSE THAT ENQUIRES. SOME GUESTS PREFER TO PAY MONTHLY AS THEY GO ALONG,SO THE BALANCE IS PAID OFF EARLY. THIS IS NO PROBLEM, JUST PAY WHATEVER AMOUNT YOU LIKE,WHEN YOU LIKE & IT WILL BE CREDITED TO YOUR BALANCE. IF YOU WISH TO SET UP A STANDING ORDER FOR WEEKLY/FORTNIGHTLY/MONTHLY PAYMENTS, THIS IS ALSO NO PROBLEM & EASILY ARRANGED, JUST ASK.